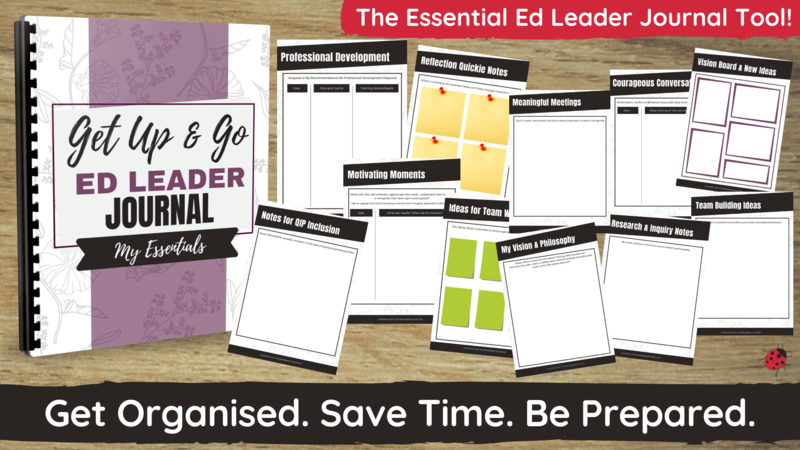 EDUCATIONAL LEADERS – Not sure what you are meant to be doing? Feeling out of your depth? 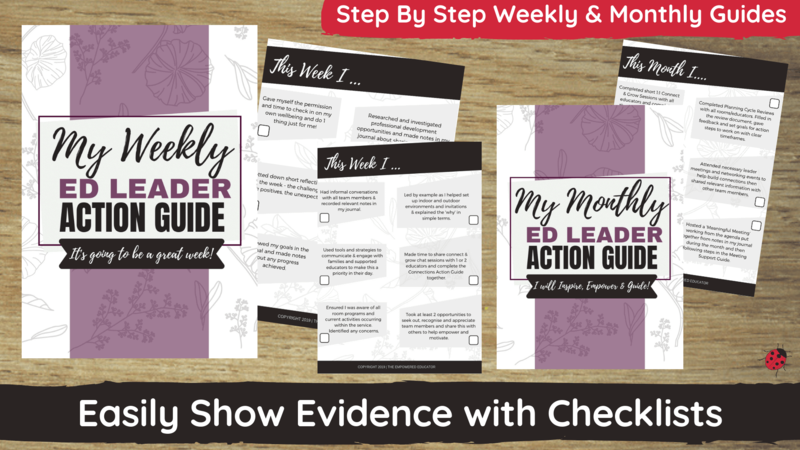 Need tools to guide you step by step? 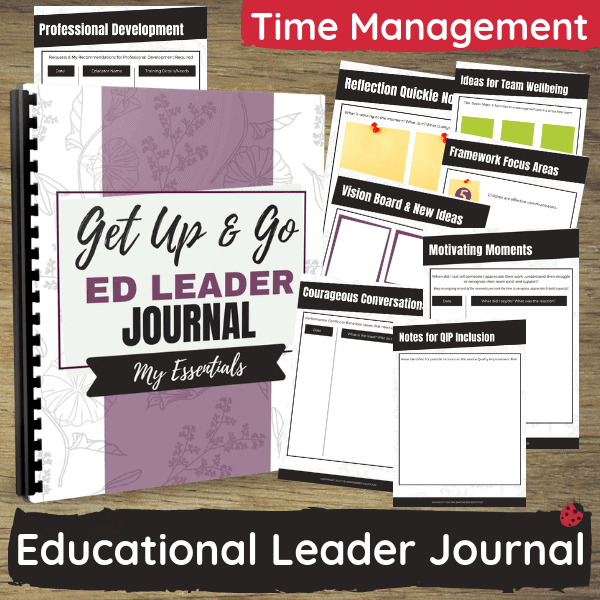 Use this journal to help you lead confidently, plan, mentor, motivate, inspire, manage your time effectively & simplify your role! HOW CAN I USE THIS JOURNAL? Manage their time more effectively. Mentor educators regularly rather than just monitoring. Present meetings educators actually want to attend! Record progress on goals and collect new ideas to share. Keep track of meetings, networking and important events. Better understand the expectations of their role. Record ongoing evidence day by day that will be ready to go for those A&R visits – no more scrambling and sleepless nights worrying! Collect information on professional development opportunities to share with their educators. ………And so much more when leaders begin using this journal created especially for their important (yet often confusing!) role. 🌈 Print & add to a folder so you can get up and go with all of your essential information at any time and write down ideas and tasks as inspiration arrives! 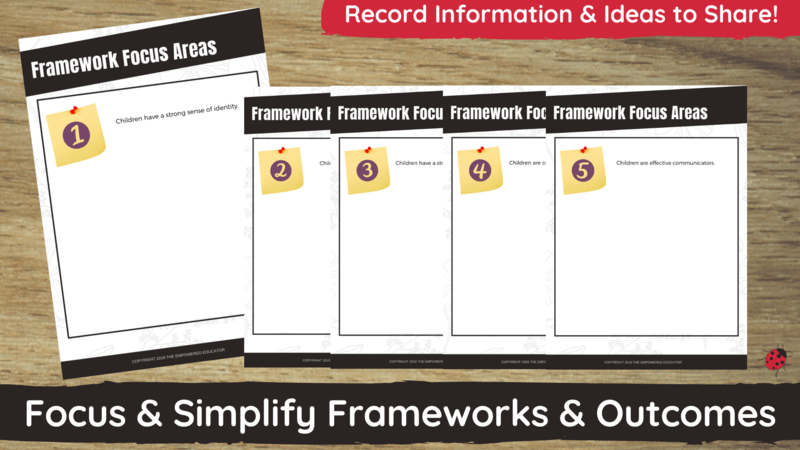 ✅ Collect and write down ideas, suggestions and reflection topics as you go for important focus areas to help you bust myths, explain and simplify linking frameworks to learning outcomes. ✅ Use simple checklists to organise, reflect on and summarise your week and month in just a few minutes. Tick off those important jobs that need to be done then keep in your journal folder to share evidence of processes and action taken regularly. ✅ Take your journal to meetings, mentor sessions, planning reviews and day to day activities to ensure you are always well prepared, organised and feeling empowered and supported in your role. 37 pages in PDF format with editable text boxes so you can either choose to print and add to a folder to take on the go with you or keep on the computer and type, printing only when necessary instead. Planning Review Notes (A place to keep confidential notes and suggestions from your monthly planning cycle reviews and help you plan ahead). **You will receive a confirmation email with an official receipt and link to download the digital journal resource immediately after payment is completed…all files are in PDF format. Please note these are digital resources and not mailed out as hard copies.